The sidewalk along Columbia Street. Photo from the "Brick x Brick" Indiegogo page. Time & Space Limited (TSL), a non-profit theater arts organization, lies on a crumbling sidewalk on Columbia Street in Hudson. For decades, commercial traffic has whizzed by, further dilapidating the walkway. The cracks and fissures make it impossible for strollers, wheelchairs, or unsure feet to get into TSL to enjoy performances. Co-founders and co-directors Linda Mussman and Claudia Bruce lobbied state and local groups for months to replace the sidewalks, though nothing came of it. The couple personally invested $30,000 last fall to take care of the issue themselves. It’s not a stretch to imagine the lack of expense funds available to nonprofit organizations on shoestring budgets. Ergo, it takes a village to raise the funds. TSL is building a community, one brick at a time. from Thomas Smith on Vimeo. Donations can be made from March 1 through March 31, the end of the month. They’re asking for locals, outsiders, and foreigners alike that appreciate the town of Hudson and/or TSL to donate to their cause. 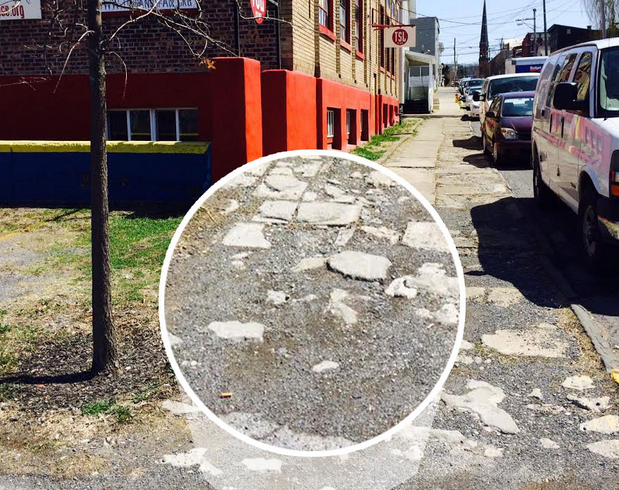 The sidewalk (or lack thereof) affects not only their business, but the town and residents of Hudson as a whole. The campaign is available on their website and on Indiegogo.